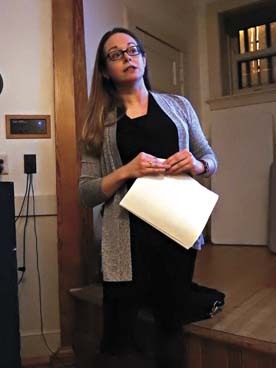 Garrett Neese/Daily Mining Gazette Veronica Webster, an associate professor of civil and environmental engineering at Michigan Technological University, delivers a seminar address Tuesday on intense rain events at the Carnegie Museum in Houghton. HOUGHTON — Going by historical norms, the storm that hit the Copper Country on June 17 was a 1,000-year event. But the combination of warmer, wetter weather and changes in land use means events like it could become more common, said Veronica Webster, an associate professor of civil and environmental engineering at Michigan Technological University. Webster’s Tuesday lecture, “Is Intense Rain the New Normal? Understanding Our Risks” was the second in the Keweenaw Natural History Seminar Series, which is focused on the causes and effects of and responses to the flood. The Keweenaw Natural History Series is a collaboration between the Carnegie Museum and the Keweenaw Land Trust. The next seminar is Jan. 22, when Melanie Cooper-Watkins will discuss storm water drainage. Flood damage accounts for about 75 percent of federal disasters, costing $8 billion of damage annually. The Huron Creek watershed has incorporated more surface runoff with the growing commercial development along M-26. Wetlands filled in for the expansion of Walmart were replaced by constructed wetlands. But those smaller ones were in another location. The creek was also rerouted to a curve near the location of the Applebee’s Restaurant. “It’s taking more of a sharp turn than it should at that location, which obviously affects how the water flows through the stream channel,” she said. In more-developed areas, storm events take a shorter amount of time to cause their peak flow, and have a higher flow. Developing the land can also alter the land surface in other ways, Webster said. Many streets in Houghton and Hancock pick up water and deliver it directly downhill. “In response to a storm like the Father’s Day event, we’ve now got a significant volume of water, being channeled down a roadway, and it’s got a significant amount of force within it that’s causing damage,” Webster said. One task facing engineers is to think about how to design infrastructure and roadways to account for higher amounts of water. Flood plains are drawn for 100-year events. Culverts are typically built with 25- or 50-year events in mind, Webster said, although they also take 100-year storm events into account. “Thinking about what’s possible with economic limitations, nobody was designing for a 1,000-year event,” she said. Those determinations use a flood frequency analysis, which looks at annual maximum flows to determine how large an event will be. A 100-year level is one with a .01 percent chance of being met or exceeded — once every 100 years, on average. But those figures assume the frequency will remain the same over time. They also the floods of the future will look like those of the past. Temperatures in the Copper Country had actually dropped in recent decades before reversing over the past 10 years. As air warms, it is able to hold more water vapor. Between 1958 and 2016, 99th percentile precipitation events — at the absolute high end of rain totals — occurred more than 40 percent more often in the Northeast and central Midwest, including Michigan. Warmer weather increases the amount of precipitation that falls as rain rather than snow, which returns to a liquid over a longer period. The higher temperatures affect the path of the northern jet stream, the path of which is determined in part by the gap between mid-latitudes and Arctic regions. With the poles warming more rapidly, the speed and path of the current is shifting course. The current is becoming more snakelike, but more sluggish, so bigger storms are more likely to linger. As development increases, the community needs to consider how runoff could increase from changes in the climate or the watershed, and take into account how roadways affect runoff patterns. “Where we choose to build and how we choose to build impacts our resilience to the increasing risk of heavy storm events and flood events,” she said.